It’s been busy busy busy since my last post. March just went pachooo and April is looking like it’ll do the same. 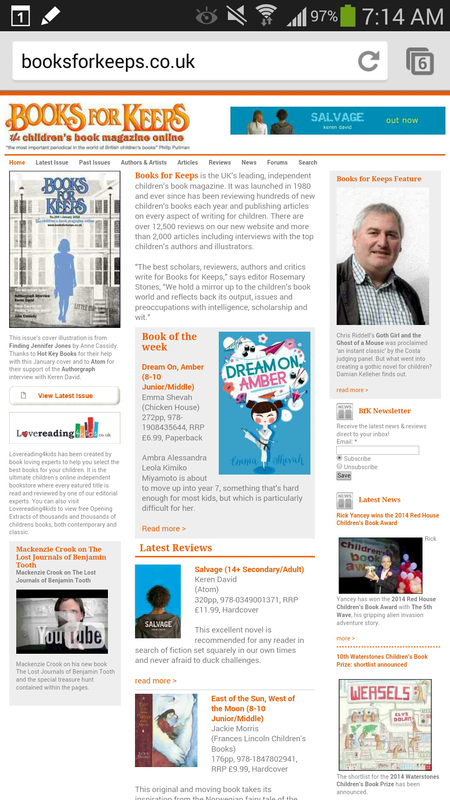 Amber has had a lovely review in the Lancashire Evening Post, was Books for Keeps Book of the Week, and has had fab reviews from readers aged 8-11 at Love Reading4Kids. I’ve shared my ‘Inheritance Books’ on the 4 o’clock Show on Radio 4 Extra, which was so much fun, I want to do it again. I’ve been interviewed and appeared in The Jewish Chronicle; I’ve talked to Years 4, 5 and 6 at a school in Chelmsford and then to three schools in three different libraries in Haringey, each to 50 children, where we cooked up ideas for story writing. Seeing as that wasn’t quite busy enough for me, I also gave a talk on Mindfulness for JOFA, and repeated it a week later. Of course, what I’m really trying to do in between all that is write my next book but I’m not getting very far because every five minutes I either have to take someone somewhere, pick someone up, take someone for an appointment, fill in, scan and send forms, go to the bank, shop, cook, clean, fix and then of course there are BIG holidays coming up that require BIG amounts of time and effort. Oh, and I’ve got a new job starting at the end of April because I also have to feed my children. The best news has to be that today, just today, I heard that Amber has been sold to France! Vive La France, that’s all I can say. So now it’ll be in German, Turkish, Italian and French, and possibly Dutch too (Alsjeblieft koop mijn boek, Nederland). I’m not sure if that means ‘Please buy my book, Holland’ but that’s what it’s meant to say. I’m still holding out for the USA but I’m very happy with progress so far. Let’s hope April is a tiny weeny bit less busy so I can write.